Signing books is lots of fun! It's easiest if you are prepared. Here are some hints/tips that I learned when I did my first signing. Still have questions? Send me an email kkunnecke@kylewilliam.com and I'll be happy to answer! Have a few good pens to sign with - I like permanent sharpie with a sharp tip, but people like different things. If your pen bleeds or takes time to dry, you might want to have some sort of sheet to put in the book to act as blotting paper. "Happy Knitting" is my favorite... Elizabeth Zimmerman is famous for saying "Knit On!" -- what will you say? Some folks won't want a dedication in the book. Have a small pad of paper and pencil ready for people to write their names so that you know how to spell the name. It might be Kathy, Kathe, Cathi... easiest way to know is to have them spell it out. 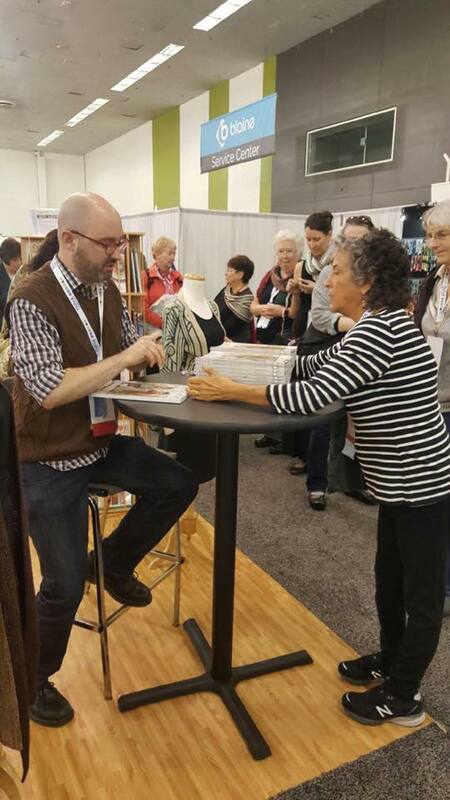 Sometimes there aren't many people at signings... and if you're selling the books, it's best to have someone else doing the transactions so you can focus on talking to visitors. At giveaway events, it's easiest to have a small stack of your book by you that gets replenished. Ask someone to take photos while you sign - those images can be used to beef up your marketing materials, as well as your social media outlets. Also sometimes the venue (LYS or event) might use those images as well in their media. Have business cards ready to pass out! If you have your website updated, be sure to include information about teaching/signing events in your materials. Know who to talk to in order to get more books. Be ready (especially at events like TNNA) to share the number of where a shop owner might call to order more books.